The assembly line has long been considered one of the greatest innovations of the 20th century. It has shaped the industrial world so strongly that businesses that did not adopt the practice soon became extinct, and it was one of the key factors that helped integrate the automobile into American society. Prior to the Industrial Revolution, manufactured goods were usually made by hand with individual workers taking expertise in one portion of a product. Each expert would create his own part of the item with simple tools. After each component was crafted they would be brought together to complete the final product. As early as the 12th century, workers in the Venetian Arsenal produced ships by moving them down a canal where they were fitted with new parts at each stop. During its most successful time, the Venetian Arsenal could complete one ship each day. With the start of the Industrial Revolution, machines began to perform work that once required human hands. With the use of machines, factories sprang up to replace small craft shops. This change was made possible by the concept of interchangeable parts, an innovation designed by Eli Whitney. The concept of interchangeable parts first took ground in the firearms industry when French gunsmith Honoré LeBlanc promoted the idea of using standardized gun parts. Before this, firearms were made individually by hand, thus each weapon was unique and could not be easily fixed if broken. Fellow gunsmiths realized the effect LeBlanc’s idea could have on their custom creations and the concept failed to catch on. Another European craftsman had similar ideas. Naval engineer Samuel Bentham, from England, used uniform parts in the production of wooden pulleys for ships. It wasn’t until Eli Whitney introduced the idea in the United States that the practice took off. He was able to use a large unskilled work force and standardized equipment to produce large numbers of identical gun parts at a low cost, within a short amount of time. It also made repair and parts replacement more suitable. Ransom Olds created and patented the assembly line in 1901. Switching to this process allowed his car manufacturing company to increase output by 500 percent in one year. The Curved Dash model was able to be produced at an exceptionally high rate of 20 units per day. The Oldsmobile brand then had the ability to create a vehicle with a low price, simple assembly and stylish features. 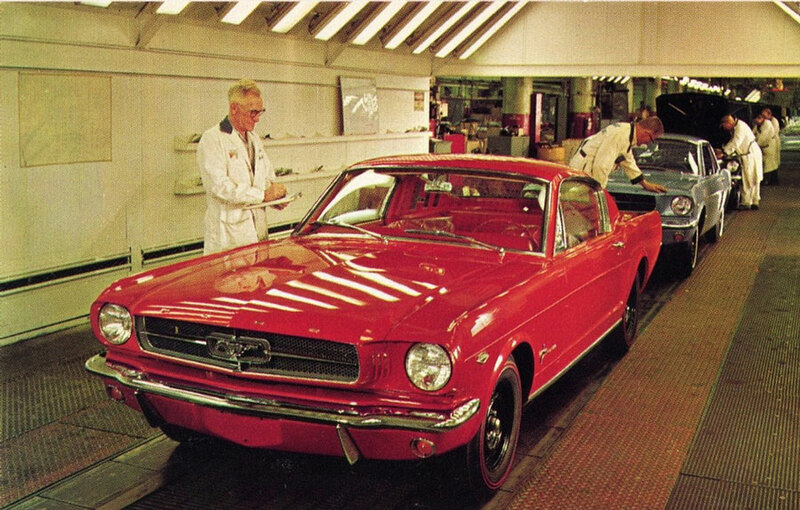 Their car was the first to be produced in large quantities. 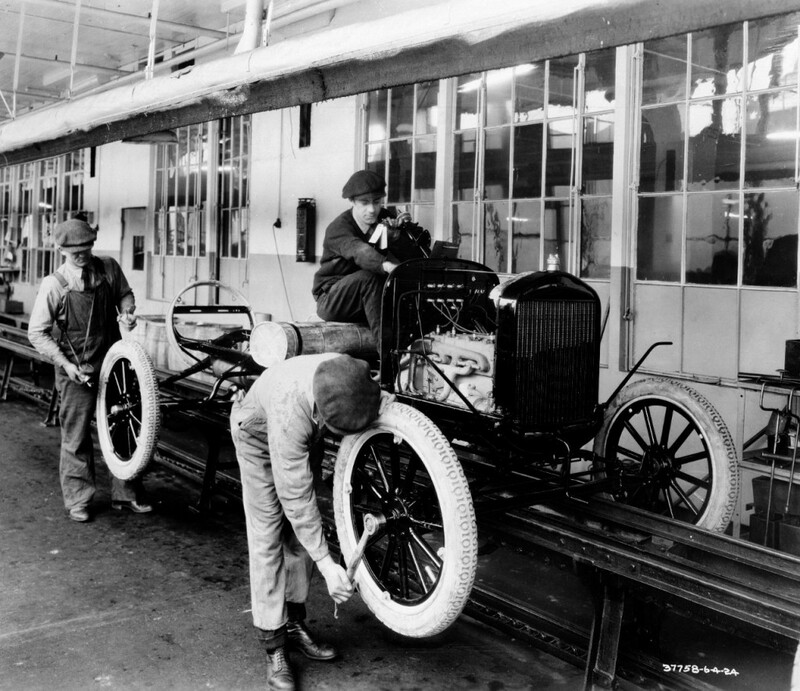 Olds’ assembly line method was the first to be used in the automotive industry and served as the model for which Henry Ford created his own. Henry Ford improved upon the assembly line concept by using the moving platforms of a conveyor system. In this system the chassis of the vehicle was towed by a rope that moved it from station to station in order to allow workers to assemble each part. Using this method, the Model T could be produced every ninety minutes, or totaling nearly two million units in one of their best years. Often credited as the father of the assembly line, he would be more appropriately referred to as the father of automotive mass production. Throughout the 1950s and 1960s, engineers around the world experimented with robotics as a means of industrial development. 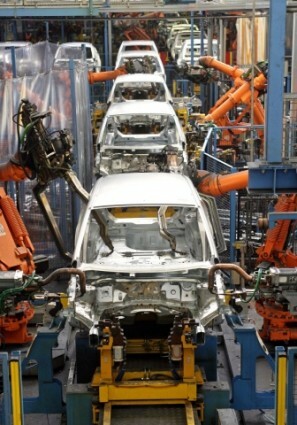 General Motors installed its own robotic arm to assist in the assembly line in 1961. In 1969, Stanford engineer Victor Scheinman created the Stanford Arm, a 6-axis robot that could move and assemble parts in a continuous repeated pattern. This invention expanded robot use in ways that continue to be applied in modern assembly. At Philips Electronics factory in the Netherlands, production is completed by a number of robot arms assigned to specific tasks. Today robotics are reaching a completely new level of sophistication. Companies like Rethink Robotics are striving to develop adaptive manufacturing robots that can work next to humans; these robots would help to improve efficiency and increase productivity. Rethink Robotics especially is working on making their robots low-cost and user-friendly. Rethink Robotics’ Baxter robot, originally launched in 2012, is being upgraded all the time. Unbounded Robotics recently launched a robot called UBR-1, with manipulation, intelligence, and mobility for under $50k. It is being offered to universities as a research platform, similar to Baxter, but mobile. The one-armed robot can do human-scale tasks and offers advanced software and state-of-the-art hardware. Unbounded Robotics has been taking orders for UBR-1 and plans to start shipping this summer. Lest anyone think that robotics are not cost-effective and that they will replace humans in the workplace, it should be said that in fact, robots like Baxter operate at about $3 per hour and that three to five million new jobs will be created this decade due to the creation of Baxter and other co-robots. And not only that, but U.S. efficiency and productivity are three times that of China. It’s obvious that robotics already have and will certainly continue to have a place in the world of manufacturing in the future, if not in other areas of life. With the increase in technology that we see every year, there are great things to be seen in the field of robotics in the near future.